Champlain Door Systems – Simply the best! Welcome to Champlain Door Systems, a proud family-owned and operated business. We believe in treating all of our valued customers like family! We have been installing and repairing garage doors and openers throughout the Georgia, Vermont area since 1990. New construction? Renovations? We do it all! If you are looking for top-quality construction, we recommend our line of GARAGA garage doors. Made in North America, GARAGA garage doors come in a wide array of models and colors. In addition to many beautiful traditional, country and contemporary designs, we carry a selection of industrial-strength doors for the workplace. Please visit our image gallery to see our full collection. To learn more about our great products, visit our showroom at 4182 Highbridge Road, Georgia, VT, 05468, or call us at 802-524-7595. Our team will be happy to help you choose the right residential, commercial, agricultural or industrial garage doors for your home or business. We are open from 6:30 AM to 4 PM, Monday through Friday. To make your garage door safer and easier to use, we recommend installing an automatic door opener. You’ll be able to do all of the heavy lifting with the touch of a finger! At Champlain Door Systems, we sell LiftMaster openers made by Chamberlain. LiftMaster is the best-selling brand of professionally installed openers in North America. This brand has been on the market for over 45 years. In that time, these products have proven to be the safest and most durable. The LiftMaster line of state-of-the-art openers offers convenient features such as wireless access, smartphone apps, lights and more. We sell garage door openers for all applications, from residential to commercial. Please see our online door opener gallery to find the full list of features and accessories. Not sure which opener is right for your garage door? We are happy to recommend the models that meet your needs. At Champlain Door Systems, we are known for our quality, price and reputation. The products we sell are of the highest quality, while still being affordable. All of our products come with a one year warranty. 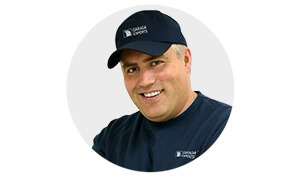 Our installers are Garaga Experts, which means your new GARAGA garage door will be installed according to the highest safety standards in the industry. In need of quick service? Thanks to our large fleet of service vehicles and 24 hour emergency assistance, we are always ready to serve you. We also offer preventive maintenance programs to keep your garage doors and openers working effortlessly all year long. We serve the greater Georgia, VT, area including St. Albans, Colchester, Burlington, Stowe, Barre, Williston, South Burlington and more. Visit us at 4182 Highbridge Road, Georgia, VT, 05468, or call us at 802-524-7595 for your next garage door installation, repair or maintenance. We look forward to making your next project a reality! We serve the greater Georgia, VT, area including St. Albans, Colchester, Burlington, Stowe, Barre, Williston, South Burlington and more. Visit us at 4182 Highbridge Road, Georgia, VT, 05468, or call us at 802-524-7595 for your next garage door installation, repair or maintenance. We look forward to making your next project a reality!. Georgia, Montpelier, Burlington, Stowe, Waterbury, Williston and the surrounding Vermont areas.